Many golfers think that as long as they know what shaft flex they require, then they can always find a club that fits them. Not so, I’m afraid. Some use online fitting tools matching swing speed to flex. That doesn’t work either. The weight of the shaft, it’s torque, and its actual flex all create performance characteristics that impact on your ability to control the club head, generate club head speed, and ensure square contact at impact. 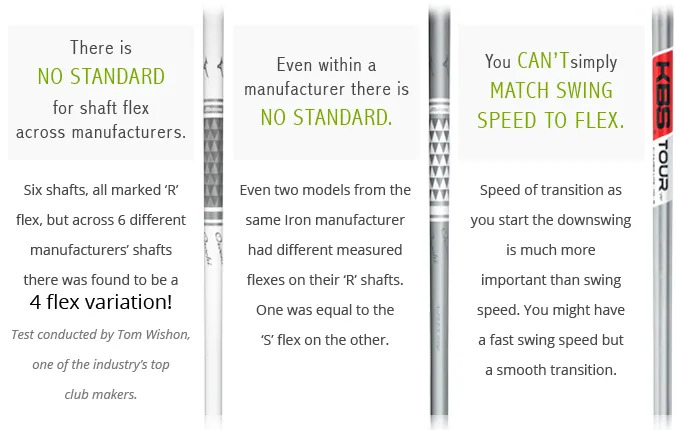 Distance, accuracy and consistency are all significantly impacted by the shaft. Get Fitted professionally. Two minutes. Three simple questions. Four prizes to be won. And I’ll be extremely grateful for your feedback.